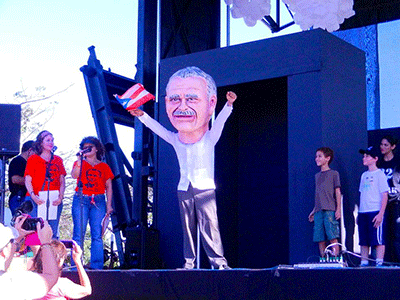 The series “Manos en la Cristal” is published online by the Puerto Rican newspaper El Nuevo Dia (endi.com) every Saturday in Spanish and is the correspondence by Oscar Lopez Rivera to his granddaughter, Karina. The title, “Hands on the Prison Glass” comes from an essay originally written by Karina and her mother, Clarisa, for the catalogue produced for “Not Enough Space”, the traveling art exhibition of Carlos Alberto Torres and Oscar’s art, and has evolved into a moving metaphor for reaching beyond the prison’s dehumanizing environment and communicating with his daughter and granddaughter through the prison walls. Download/read the story Manos de cristal-web. All the letters in Spanish are here. You will be directed to a Google doc with links to all the letters in Spanish (15 as of Jan. 11, 2014) on the El Nuevo Dia Interactivo website, in a new window. The links to the letters will become live as we post new translations.